The protection of your sensitive electronic information is often overlooked in a company’s data destruction plan. Many companies are beginning to rely on software to delete their data, but software comes with limitations and more often than not leaves hard drives vulnerable to attack by determined hackers. So, what’s the solution? 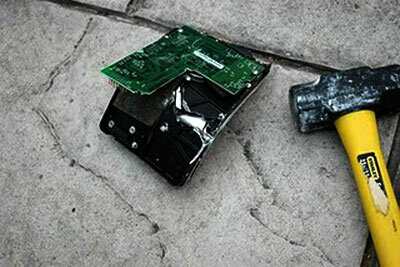 In our experience, the most reliable solution for your company’s security is physical hard drive destruction. Recovering data from hard drives is easy. Even if the file has been deleted, there are plenty of free tools readily available to recover deleted files. Additionally, deleting files manually leaves room for user error. The vulnerabilities of wiping a hard drive are two-fold. First, there are limitations on the effectiveness of the software used to wipe the information on the hard drive. Second, there are severe limitations on the ability to verify or validate that the process has been successfully completed. AccuShred firmly believes that total physical destruction is the only fail-safe method of destroying data stored on hard drives, disks and other storage devices. That is why we shred and recycle each and every hard drive that we receive. We NEVER sell intact hard drives – period. Learn more about our hard drive destruction options. One estimation puts the capacity of a 1 terabyte hard drive at 100 million double-sided pages in Word Document format. Assuming 0.16 ounces per page, that comes out to 1 million pounds of paper! We’re willing to bet that you wouldn’t let 100 million pages of documents get into the hands of a stranger. If you intend to donate or recycle a computer, insure that the hard drive is first removed and properly disposed of. At AccuShred, we offer both on-site and off-site data destruction options. Depending on your individual needs, AccuShred offers daily, weekly, monthly, or on-call destruction services. We provide free-of-charge, specially designed, secure locking bins or console units placed strategically throughout your office or facility. These containers are used to safely deposit and store your sensitive information. Learn more about our data destruction options.